Jake Bauers is being traded to the Cleveland Indians in a surprising move by the franchise. 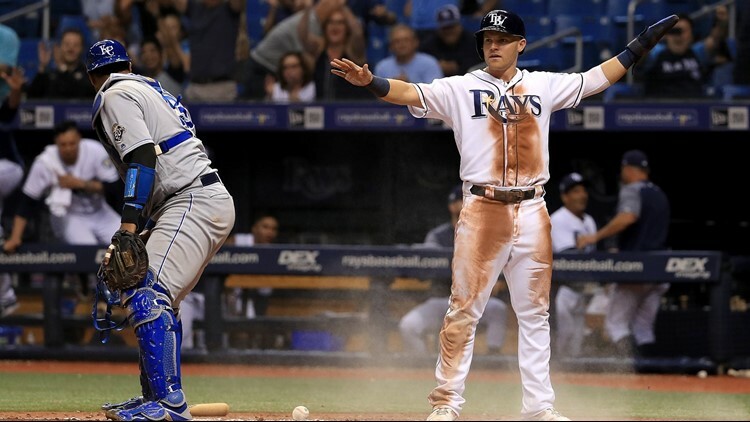 TAMPA, Fla. -- Tampa Bay Rays Senior VP of Baseball Operations Erik Neander said Wednesday that Jake Bauers was “our guy” at first base for the 2019 season. One day later, Bauers is no longer on the roster. Tampa Bay continued to be active at Thursday’s MLB Winter Meetings in Las Vegas, trading Bauers to the Cleveland Indians in a surprising move that landed them 27-year-old infielder Yandy Diaz in a three-team deal that also included the Seattle Mariners. The Rays also sent $5 million in cash to Seattle, according to MLB Network, to complete the trade. Bauers, who hit .201 with 11 home runs in 96 games for the 90-win Rays last season, burst on the scene in June, hitting nine homers in his first 48 games, but struggled down the stretch during his first big-league season. He showed potential, but the Rays see Diaz as an upgrade offensively and offers the club defensively flexibility. Diaz hit .283 with 28 RBI in 88 games last season with Cleveland. The Rays also acquired minor league right-handed pitcher Cole Sulser in the deal. The Rays continue to stay active in the offseason, reportedly adding free-agent pitcher Charlie Morton on Wednesday with a 2-year, $30 million deal. They also continue to be linked to sluggers Edwin Encarnacion, Nelson Cruz and trade target J.T. Realmuto.